I've been pinning my heart out lately. One such board is focused on spectacular ceilings, coffered and otherwise. 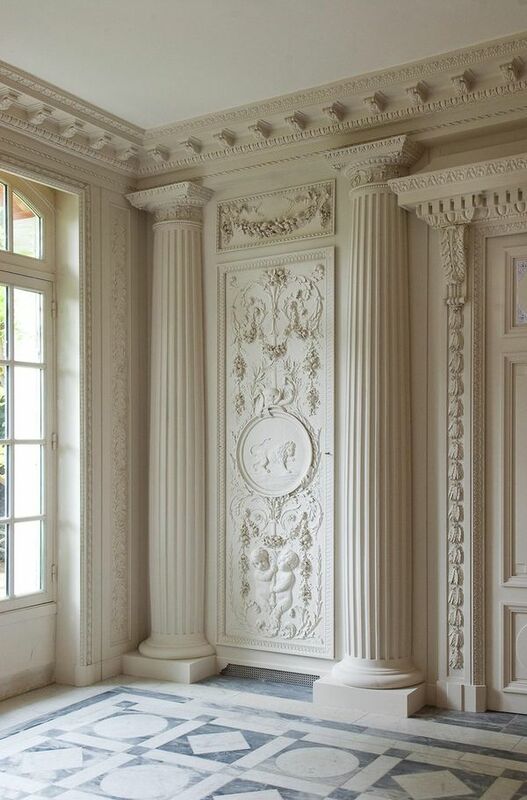 Another delights in the beauty of boiserie. These are architectural details that so often today are not part of the modern construction process. Cost is an obvious factor, but I believe a perceived lack of interest and inspiration are the true culprits. Until they reached out to me and asked to be a blog sponsor, I'd not heard of Metrie. One look at their beautifully designed site and AMAZING products won me over. They step in where builders often step out. Adding layers of details such as these is a labor of love, not born of necessity. The trend towards modern and transitional interiors have given some builders even less of a reason to consider paneled walls and coffered ceilings. Yet in that absence of detail a craving for the fussiness and fabulousness of the past is born. I am grateful to live in a home with detailed millwork and substantial architectural details on the inside. These are aspects of my home's design I appreciate each and every time I see them. Sculpted baseboards, paneled library walls, rosettes and wall moulding lend interest to the bones of the house and make it a joy to live in. It's no Chateau du Grand-Lucé, I assure you, but I love it nonetheless! That said, a modern house can still benefit from interesting details. A herringbone ceiling, raised panels... it all tells a story and creates a feast for the eyes. Repeatedly, I see spaces that ooze a certain sense of modern cool but possess innovative architectural details. Metrie was created for fans of such details - whether or not the builder shared that vision from the start. 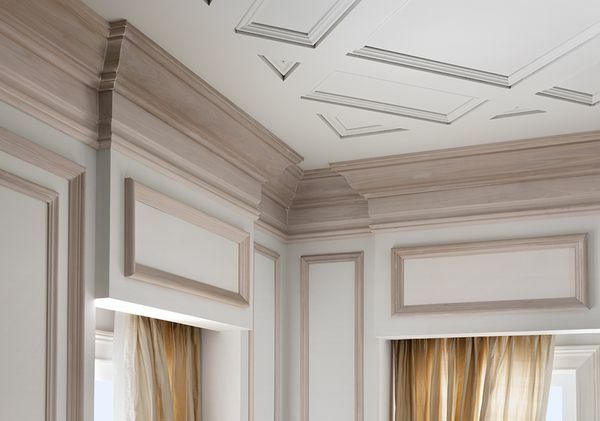 From solid core doors with Neo-Classical designs to marvelous mouldings for ceilings and walls, Metrie makes it easy for designers and decorators to give their clients the rich interior architecture may of us pine for these days. I can assure you, any nursery I decorated in the past would surely have benefitted from a glossy coffered ceiling to highlight a glistening chandelier. Those details make a room sing and set the stage for elegant living - the goal of every great design plan. But I digress... back to my thoughts on this brand. The lovely team at Metrie asked me to look around their site as well as The Finished Space for inspiration. I assure you, very little prodding was necessary. Between the Style Quiz and the Room Styler it's clear the brand is focused on ease of use for the end user. No guesswork is necessary. The quiz nailed my preferences perfectly: I'm a girl with a weakness for the French Curves collection. Classic details inspired by the Baroque and Empire periods that lend a romantic and glamorous look to any room. No surprise there! Whether you're a designer friend of mine or just a design enthusiast, you'll want to have a look Metrie's beautiful collections. Created with designer collaborations and usage in mind, this brand is sure to be a new favorite for many of you out there. Follow them on twitter at @OfficialMetrie like them on facebook and visit them online. Be sure to take the quiz! You'll love seeing how it perfectly identifies your interior preferences by asking just a few easy questions. Special thanks to Metrie for reaching out and saying hello. I'm thrilled to now be aware of your beautiful products and I look forward to dreaming up ways to use them on future projects.